Delta state governor, Ifeanyi Okowa has said he will not take any Chieftaincy title while in office. 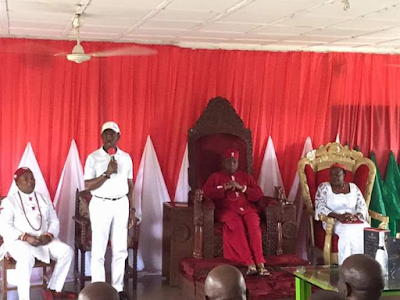 Okowa stated this today when he paid a courtesy call on the Odio Ologbo of Oleh in Isoko South local government area of Delta State, HRM Anthony Ovramwah who was celebrating his 80th birthday. While at the monarch's palace, Okowa expressed gratitude to different Kingdoms that desire to honour him with Chieftaincy titles but stated that such titles would be taken after he has left office as Governor.